Karas Kustoms Ink Fountain Pen Review – Pens! Paper! Pencils! 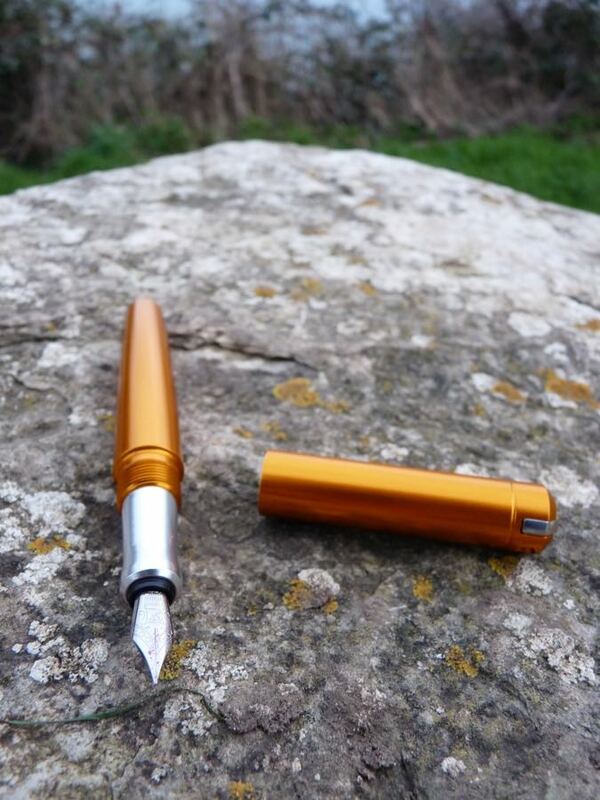 The Ink is a machined aluminium fountain pen made by Karas Kustoms. It’s available in a wide range of colours and can be bought with an aluminium section (as with mine) or alternatively with a brass or copper section (for a few more dollars). 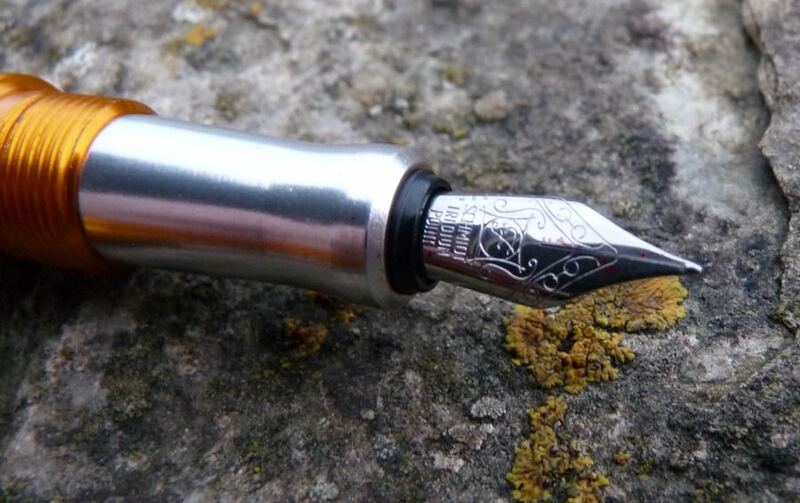 A converter is included and the nib is available in fine, medium or broad. I bought mine via Kickstarter but they can be found online for $85. There’s also a rollerball version. The pen is a good healthy size but also quite light, making it easy to hold and write with. It is quite wide – something to bear in mind if you have little hands. The shape of the section helps here, though. It narrows where you place your fingers which makes for a very comfortable grip. The threads are above this section, well out of the way. The cap screws on. 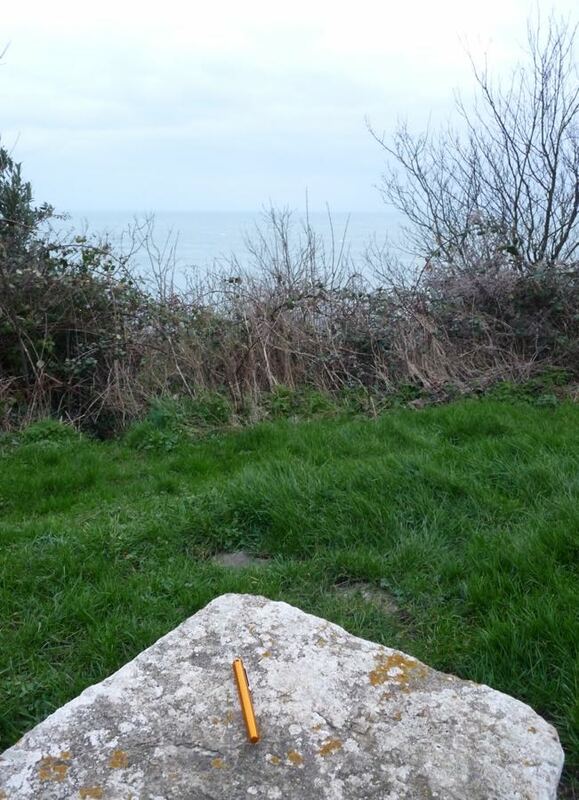 It does, technically, post but not very deeply meaning the pen is totally unbalanced and the cap likely to fall off. Not to be recommended. The clip is a a very firm piece of metal which isn’t all that great as an actual clip (it doesn’t budge so unless what you want to clip onto is the right thickness it’ll either be too loose or not go on at all) but is an excellent tuning fork. A little tap and it rings out. The nib on mine is a Schmidt fine. It’s perfectly okay, writing smoothly and without any skips or hard starts. It’s a standard number 5 size and so easily replaced, should you wish to. After this review I put in a Franklin-Christoph medium stub, one of my favourite nibs. It’s not that the Schmidt nib is bad. It just isn’t very special and, as I will shortly reveal, I love this pen and feel it deserves a nib that is special. A Schmidt converter is included and works as it should. You can also use standard international cartridges. 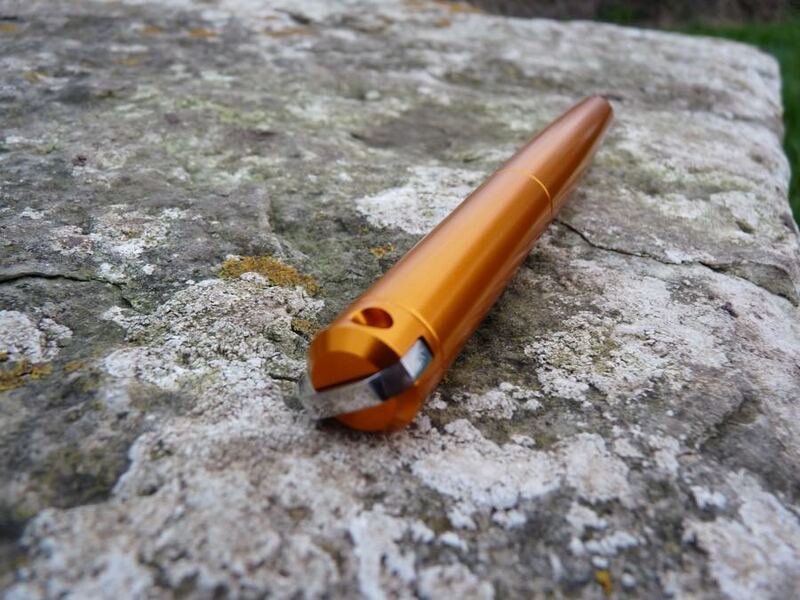 Karas Kustoms really know what they’re doing when it comes to making a metal pen. The finish is excellent. I understand there were a few problems with the orange anodising so this particular colour is no longer available, which is a shame because it’s lovely. However, the other colours are also lovely so it’s not a complete disaster. The problem was simply that the colour wasn’t quite what Karas Kustoms wanted, so when they can get it how they’d like they’ll make orange Inks again. This is a good example of the care and attention that goes into making these pens. I think this colour is great. The Karas Kustoms Ink won’t be for everyone. It’s fairly large (though light and well balanced), the clip is close to useless and you can’t realistically post the cap. It’s rather obviously made from metal – in fact it embraces it’s metalness – and not everyone likes that (hard to believe, I know). For me, though, this is a wonderful pen. It’s a good honest well crafted (krafted?) pen that is comfortable to hold and writes well (even with the stock nib). 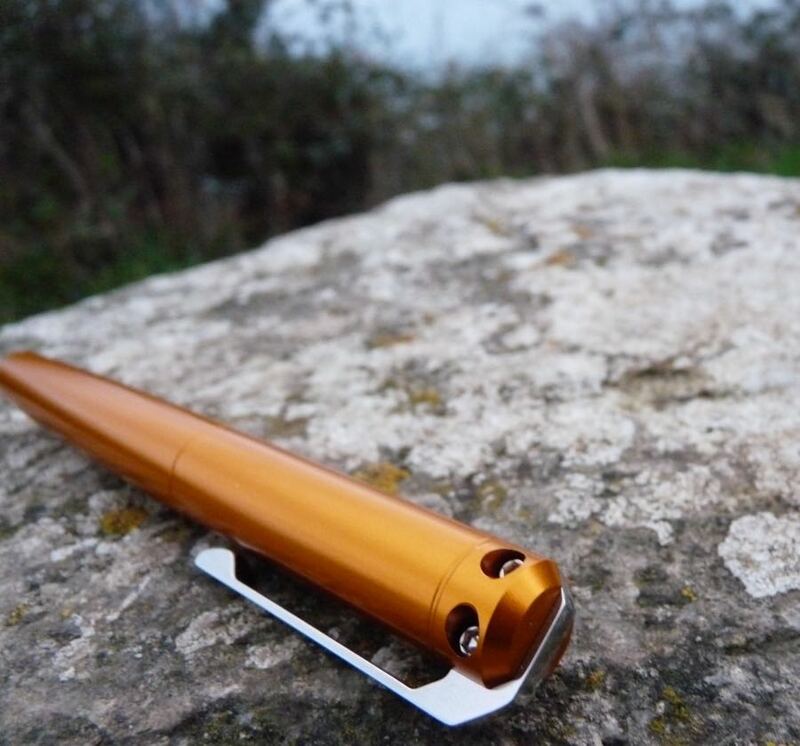 You can find some more reviews of the Karas Kustoms Ink on Pennaquod. Wonderful review of this pen. I love the colors so much.